Our daily trip budget is $150 or about $38 each for accommodation, food and activities. As we learned in Chiang Mai, it’s possible to have a blast on this meager budget (particularly in Thailand). When we’re doing detailed planning for a particular country or region we come across something which is a once-in-a-lifetime experience and is usually more expensive than our budget allows. In advance of our trip we decided to include one or two such experiences per region. For South America we chose the Inca Trail and the road trip we did in Argentina. When I read about the Gibbon Experience it seemed a perfect fit for a South-East Asian trip highlight. At heart, the Gibbon Experience is an eco-tourism operator which runs 3-day treks in Northern Laos. Accommodation during the treks is in treehouses. There is a conservation element as well since the property on which the treks are run is now a nature reserve wilderness. The operation brings business and employment to the people living in Huay Xai and the Bokeo villagers. There are three types of trek offered: Classic, Spa and Waterfall. 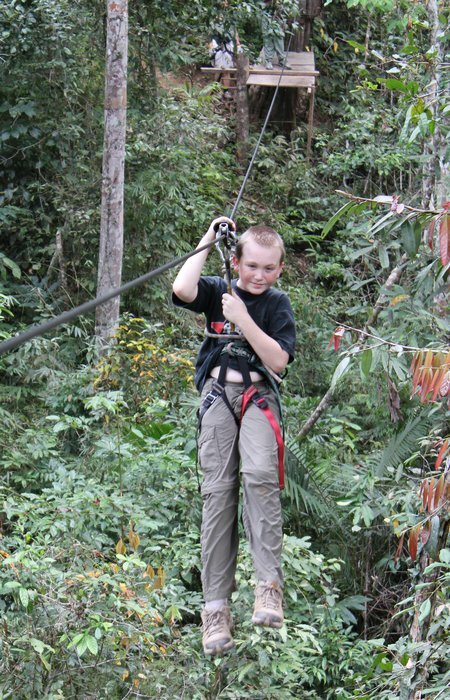 The Classic trek involves hiking two-three hours and five zip-lines to get to your treehouse. Guests doing the Spa trek need only hike one-two hours and take four zip-lines to get to their treehouse – which is in the best condition and has some of the best views of all the treehouses. Spa guests also get wine with dinner on both nights and a massage in the treehouse on the second afternoon. The Waterfall trek has more hiking with a long, five-hour trek to get to the waterfall on the first day, and a return trek to a different treehouse on the second day. All of the hiking is strenuous. The hope is that all Gibbon Experience guests will see some gibbons, but it’s not guaranteed. There are families of gibbons living in the forest around the treehouses. We did get to see gibbons on three different occasions which was fantastic. Their acrobatics in the trees are jaw-dropping, especially when, like the mom gibbon in the photo above, she was swooping 30 or 50 feet in the tree canopy with her baby (the black ball) on her chest. The treehouse accommodation is basic but comfortable but according to the other guests we met there is quite a bit of variability between the treehouses. Our treehouse (#7) was perfect. There was ample room for eight people, the food was local fare (i.e. rice at all meals) but tasty, our mattresses were three inches of sleeping comfort and although the shower was cold, the expansive jungle view to be had while showering was priceless. While bumping our way to the Bokeo village – for three hours in a converted truck with seats in the truck bed – I was very nervous. I’d heard about leeches on the trails and rats in the treehouses. I was full sure that my children would have my guts for garters if any of these things proved to be true. That and steep hikes. 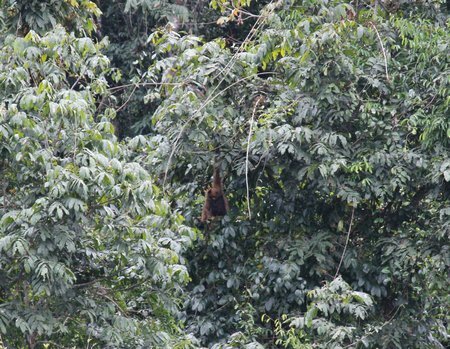 I also knew that they would find the zip-lining exhilarating and that if we saw gibbons, they would be awed by the experience of seeing these creatures in their natural habitat. My worries were exacerbated by an out-going guest who we met at the village who complained incessantly about her time. “We could hear the rats at night and there was only rice at every meal” she said. Thankfully CAM and BigB didn’t hear her rabbiting on. The hike to our treehouse was tough but short. The difference to the Inca Trail, where the guides waited and judged guests’ fitness before setting a pace, was immediately obvious. Our guide knew the trail and had a deadline (lunch) which he had to keep. He didn’t tell us about the deadline, just set off at a fair clip and we hurried along after him. As it turned out everyone in our group was fairly fit and although we strung out behind the guide we kept together pretty easily. Once settled into our treehouse I had no need to worry any more. The hike up had been fine – there were no leeches. The treehouse was beautiful, in construction and surroundings, and lunch was delicious. During the course of our visit the other guests did, unfortunately, validate some of the negatives which I’d previously heard. Apparently Treehouse #2 absolutely does have rats and the mattresses in Treehouse #3 are foam sheets thinner than a standard Thermarest, making sleeping difficult. Although our initial preference was for the Waterfall trek, the only spots available when we booked were for the Spa experience. The price difference is about $50 – which hardly justifies a bottle of Penfolds and a massage. But, the massage was tree-mend-ous (excuse the pun). And, if the Spa package pricing also reflects the specific treehouse and the guides, then it’s absolutely worth the extra cost. Our guides, Tja Li and Pa Lao were excellent. Although none of the guides have great language skills, these two went out of their way to communicate with us about the trails, the Gibbon Experience, the animals, their lives in the village and as guides and to learn about us. 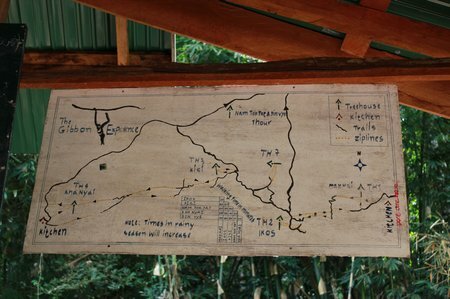 This is the trail map that we photographed at the kitchen building mid-way between the village and the treehouses. There was unanimous agreement in our group that having a map like this available to all guests and at the treehouses would facilitate improved safety and allow guests who were so inclined to explore the trail and zip-line system more independently. To do this effectively, the trails, lines and junctions would have to be named or numbered – like ski trails. The second way in which I felt that Gibbon Experience could be improved would be to provide more training, in language and ecology of the jungle to the guides. Both of our guides were eager to learn more but both shared with us that they had only primary-level education. They love their work as guides because of the opportunity to meet new people and practice language skills but you could see that with a little more instruction, they could easily become future trainers or administrators of the project.